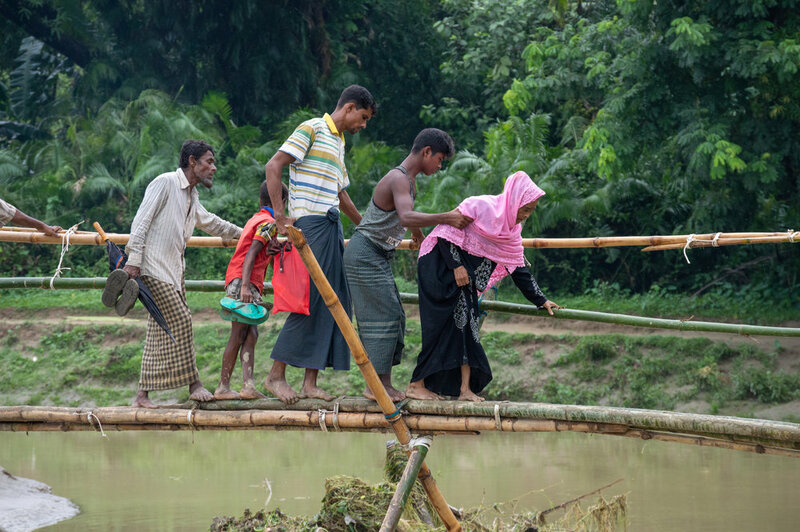 A group of Rohingya villagers living in No Man’s Land—a precariously situated area just on the Myanmar-Bangladesh border—make their way across the river on a hastily constructed temporary bridge, erected shortly after the first rains of the monsoon season destroyed the more regular bridge. Photo by Leif B. Kennedy, June 11, 2018. The UN has dubbed the Rohingya "among the most persecuted minorities in the world," with well over as many as two million refugees living around the world—nearly one million of whom are currently sheltering in makeshift refugee camps in Bangladesh. Though Rohingya Muslims have resided in Myanmar's Northern Rakhine State for generations, much of Myanmar society, which is majority-Buddhist, nonetheless consider the Rohingya to be illegal Bengali "migrants," and the Myanmar government denies them citizenship on this basis. The Rohingya have thus faced racial and ethnicity-based persecution for decades, with various pogroms designed to oust the Rohingya from their ancestral lands dating as far back as "Operation King Dragon" in 1978. The Rohingya have also endured an ever-growing list of discriminatory policies and state-sanctioned rights violations designed to cull the unwanted minority's numbers and force them from their lands: key markers of genocide. The oldest among them have seen their citizenship revoked and their children born stateless; they suffer tight restrictions on movement and access to education and healthcare; and the number of children a couple may bear has been legally limited to two. The Rohingya also regularly endure extortions for minor "offenses"; they have been barred from gathering in groups of more than five and require permission to hold routine events (like marriages); and have even faced limitations on the materials used to build or repair homes and other buildings (brick and concrete being considered too "permanent" for the unwanted minority). Direct reports from at least one prison also indicate that some prisoners from other parts of the country had been released early on condition that they resettle in Northern Rakhine in order to maximise the Buddhist population and limit Rohingya landholdings. View from rooftop in Maungdaw, Northern Rakhine State, Myanmar. Taken August 23, 2017, just two nights before the Rohingya humanitarian catastrophe and refugee crisis began. Later that night, distant gunfire was heard, sparking suspicions among colleagues of a larger crisis brewing. Photo by Ashley S. Kinseth. Yet the present crisis undoubtedly represents the most extreme and disproportionate onslaught of violence, with widely corroborated horror tales from Rohingya refugees of savagely violent gang rapes, merciless tortures and beheadings, and even babies tossed into fires. Since August 25, 2017, over 800,000 Rohingya have fled to neighboring Bangladesh as their family members and brethren were raped and slaughtered, their homes and crops razed—and eventually, many of the villages they had called home for generations turned into military outposts. To this day, many Rohingya continue to attempt to flee, often by dangerous boat journeys that, some report, are secretly supported by the génocidaires themselves, with little regard for, or expectation of, the refugees making it to their intended destinations alive. In the midst of the battering monsoon season, both the Rohingya in Bangladesh's camps and those who would make such dangerous boat journeys are at heightened risk. Those in the camps face flooding, dangerous landslides, and increased spread of disease, while those who flee by boat will face even more dangerous swells and storms at sea. Meanwhile, hate speech against the Rohingya continues to run rampant in Myanmar, particularly on social media; and reports have also emerged that the Rohingya who remain in Northern Rakhine today suffer dire food shortages as the Myanmar military intentionally blocks aid to the region and upholds its tight restrictions on Rohingya movement. In light of these factors, although tentative plans for repatriation have been made, most Rohingya refugees are justifiably fearful of the prospect of returning to Myanmar—especially when doing so would also mean being forced to state that they are illegal "Bengali migrants," as mandated by the Myanmar government. 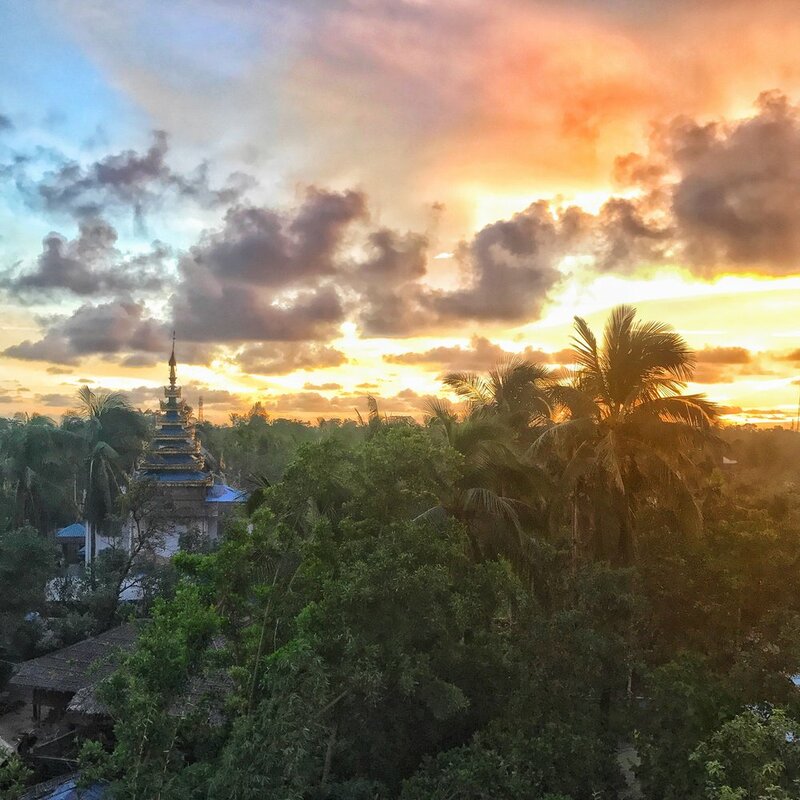 With that in mind, Stateless Dignity is working tirelessly not only to advocate for the Rohingya and share their stories with the world, and ideally, to help find welcoming and safe homes, and to make their way there safely, affordably, and legally. For more on how our organization works toward these goals, please see Our Mission.